Yang, Gene Luen. (2011). Level Up. New York: First Second. 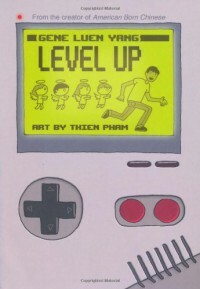 Gene Luen Yang, author of multi-award-winning American Born Chinese (First Second, 2006), returns with his Eisner-nominated graphic novel Level Up, a loosely autobiographical tale about Dennis Ouyang, the only child of Chinese immigrant parents, and his struggle to find fulfilment without disappointing his parents. Dennis aspires to play video games, and the book’s structure reflects that of a classic adventure game, each “level” increasing in conflict until he faces the ‘boss’of self-actualisation. 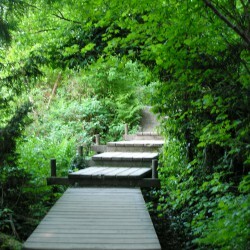 The introduction sets up the initial conflict: his father wants him to be a doctor. What follows through the levels of play is Dennis’ own hero quest. First, Dennis flunks out of college because of his gaming obsession, and his mentors to appear in the guise of four angels. They remind him of a card his late father gave him years ago, the only time he said he was proud of Dennis. The angels coach him to pass his first test: earning his spot in medical school. Once there, Dennis toils, with the help of new friends and the angels, to excel in gastroenterology, but he’s disillusioned. When one friend questions his commitment, he realises he’s living his father’s dreams, not his own. After Dennis tells the angels he’s quitting med school, they retaliate and give chase, morphing into ghosts in pursuit. Dennis realises f they can become ghosts, he can be Pac-Man and consume them, but as he does so, he has visions of their symbolism: the regrets of his father. The reason for all their pressure to succeed now clear, he stops living vicariously for his late father. But despite winning trophies and prizes, being a pro gamer doesn’t make him happy. A chance meeting with a former patient whose life he had unknowingly saved makes Dennis reconsider his path. Finally, Dennis returns to gastroenterology, where he discovers that gaming skills have a medical application too. The first person narrative is illustrated by Thien Pham in a simple, monochromatic style. He deftly uses colour palettes to differentiate flashbacks, memories, and visions from the current action which helps reduce the reader’s reliance of descriptive text to navigate the time and reality shifts. While coping with the pressures of being their parents’ legacy is something many students can relate to, it may resonate especially for children of immigrants. The fantastical elements allow Dennis to voice his internal conflicts, making him an engaging, though flawed, hero. Highly recommended for grades 6-12.